« Bible Contradiction? Was Zechariah Iddo’s son or grandson? Here’s a 722 page book edited by Norman Geisler and David Farnell. THE MOST SHOCKING EXPOSÉ OF THE MASSIVE EROSION OF THE DOCTRINE OF INERRANCY IN THE EVANGELICAL CAMP SINCE BATTLE FOR THE BIBLE (1978)! This work examines the historical and philosophical strengths and/or weaknesses of current evangelical approaches espousing some forms of post-modernistic historiography and its resultant search for the “historical Jesus.” It demonstrates the marked undermining impact these efforts have had on the biblical text, especially the Gospels, as well as inerrancy issues. It compares the Jesus Seminar’s approach with current evangelical practices of searching in terms of their evidential apologetic impact on the trustworthiness of the Gospels. 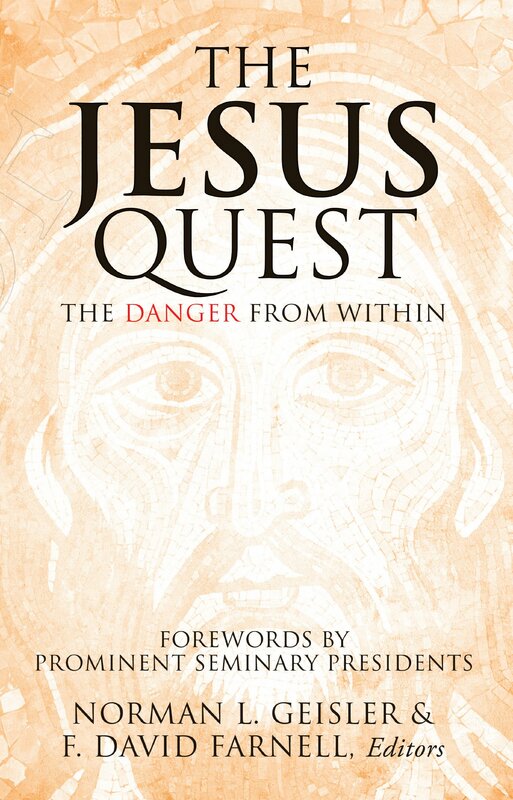 A number of well-known, contemporary evangelical scholars are involved in the so-called “Third Quest” for the historical Jesus. This book raises serious questions about such an endeavor. If you want to buy a physical copy of the book click here. Wow! Great resource! Thanks for posting this! You’re welcome and thank you for reblogging this! on October 18, 2018 at 5:18 am | Reply Μιχαήλ (Michael) | God is in a good mood! Thanks! This looks like a great resource. Grace and peace from our Master Jesus. You’re welcome! Also thank you for reblogging this and also all the interaction on Twitter, I hope you have a blessed day on Friday! Thanks. I’m sure there’s a lot of good information here but I have some major problems with Dr. Geisler as we’ve discussed before. I applaud Geisler and the others for defending the inerrancy of Scripture, but one of the other most harmful errors creeping into evangelicalism these days is ecumenism with Rome and Dr. Geisler has been a leader in that movement. When a theologian is stalwart in defending the Bible, but embraces a religious group whose teachings are un-Biblical and even anti-Biblical, they’re displaying a type of spiritual schizophrenia and that seems to be epidemic in evangelicalism these days. Again, I don’t mean to criticize your post. I imagine this is a good book. I’m just a bit frustrated with these ecumenical evangelicals. As far as ecumenism I would be careful about throwing the baby out with the bath water. What exactly is the “baby” you’re referring to? The Gospel? Biblical inerrancy? Ecumenism with a religious organization that denies the Gospel of grace and supplants Scripture with un-Biblical and anti-Biblical traditions is definitely not preserving the “baby” either way. One of evangelicalism’s biggest problems these days is that so many people have become “careful” and tolerant when it comes to ecumenism that it’s overrun the church and error is accommodated without a peep from anyone. Sorry. I was referring to individuals not organizations. Good point gw. The PDF is huge! It seems like a good book from the little I got to read and scanning the table of contents! I think if Geisler is ecumenical it is because he is inconsistent and yet inerrancy he’s defended well. Sometimes you’re right we must not throw the baby out with the bath water. Christians must practice discernment and realize others are not perfect. I thought Geisler has written against Catholicism? There is a sermon on his site on why he’s not a Roman Catholic. He’s like William Lane Craig (a disciple of Geisler’s) who says Catholicism deviates from Biblical truth with several doctrines, including justification, but yet somehow is still a Christian entity and still preaches the gospel at its core. I didn’t realize it until you commented but someone once gave me a CD of Geisler’s life work. I believe the book thebereancall.org referenced “Roman Catholics and Evangelicals: Agreements and Differences” is in the package. I’ll have to dig it out as the last time I saw the CD was when I got married! The reason why I want to dig that up is because in my opinion The Berean Call at times can misrepresent those whom they disagree with and I’ve seen that over the years with how they did that with others. Yet I don’t want to outright dismiss them since what they pointed out with the book’s endorsement by Chuck Colson and Richard John Neuhaus is very disturbing already. Thanks for the link. I pray the Lord helps you prepare the message for the grieving family. I read Geisler’s book “Is Rome the True Church?” 10 years ago. I regretted that back then I didn’t write book reviews as consistently as I do now. I don’t have any notes of my reading but back then I thought that book was a good critique of Roman Catholicism biblically speaking, though I thought there was some weird editing and repetition. I haven’t really seen Geisler as Ecumenical in the sense of ECT. With that said I think you might be referring to his embrace of Aquinas which has shaped much of his theological method and apologetic methodology? I think he has real problem in that area, much in the same way I have concern for Sproul in that area too (though they have degrees of differences with how much they drink from Aquinas and how, etc). I have posted in the past posts and resources critical of Aquinas. Actually I think both Sproul and Geisler likes Aquinas for his use of Greek Philosophy. Its ultimately the role of Greek philosophy that they want. Which brings a whole sort of problem. I did go back and forth about posting this book on the blog. Fell asleep early from being tired from the last week and hit “post” to the draft button when I woke up at 4 AM. I continue to disagree with Geisler over many areas including his view of Calvinism and apologetics’ methodology. At the end of the day I posted this because what he has to say about the Bible itself is important. Yet at the same time I’m not 100% with Geisler with the book either; I think he’s more of an uncritical Modernist in his reading of Scripture. I have more respect for Dr. Farnell who was the other editor though he’s lesser known among popular audience. Still I also feel both men at times knee-jerk in their attack of some of the other methodology in studying the New Testament. I imagine some of my more critical friends with NT background would also be equally surprised I posted this. Still in the end I felt a free book by both men who is trying to have a right bibliology and approach towards the New Testament was a resource worth having available for others especially with the call for discernment and not just uncritically drinking straight from the well of “scholarship.” There is a sense of irony I realize that Geisler can be more discerning in other areas. With that said, I think your comment is needed for readers to see that there’s legitimate concern for Geisler in other areas. If there’s more things to add, feel free to comment to about it Tom. Thanks for your comments, Jimmy. I don’t mean to go around screaming that “the sky is falling” with regards to Geisler. I’m sure this book about Biblical inerrancy has a lot of good information. However, I am disappointed with Geisler’s ecumenical approach to Catholicism, which opened up the doors for his disciples, Lane Craig, Zacharias, and Strobel to push even further. I see you’ve posted another comment in regards to the Berean Beacon, so I’ll respond to that one and append some additional info. Again, I didn’t mean my comment as a criticism of your post, but to point out the irony of Geisler defending the inerrancy of the Bible while also acknowledging the Roman Catholic church as a Christian entity that also preaches the Gospel. Thanks! Christians today need all the well guided discernment they can get concerning true biblical orthodoxy. lol. Funniest comment on here. on October 18, 2018 at 3:45 pm | Reply Μιχαήλ (Michael) | God is in a good mood! This is a great resource. I got it and started reading it today. Thanks for making it happen. Having a great mind full of wisdom although both biblical and commendable can become it own enemy as in the case of Solomon. Solomon leaned too heavily on his own understanding. I like to contrast Solomon with, the simple faith of the man born blind. The blind man’s confession, ” I once was blind but now I see”, confounded an army of Christ hating theologians. There is a saying, “to clever by half”. It is another way of saying keep it simple stupid. I fear that emotions may have over ruled reason in trying to reconcile Catholics with the gospel according to Jesus and His disciples. Perhaps this is the seed of error in so many of today’s errant movements. Loving your neighbor becomes sin when it usurps loving God above all.